Well, I recently celebrated my 32nd birthday! You can check the pictures out here! 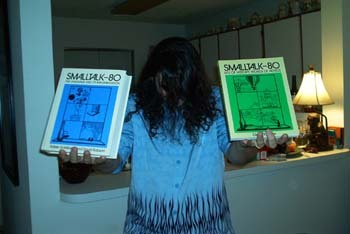 The really cool thing was that my wife, Michelle, bought me the green and blue Smalltalk-80 books!!!!! I've waited and wanted these books for many years and now they are in my possession. Quite literally these are the proverbial holy grail of OO in my opinion! If you like, you can check out the picture! I've been envious of the Dolphin Smalltalk guys for their pictures with their books, so here's mine!!!! Anyway, I'm going to eat some cake and send some emails to friends!